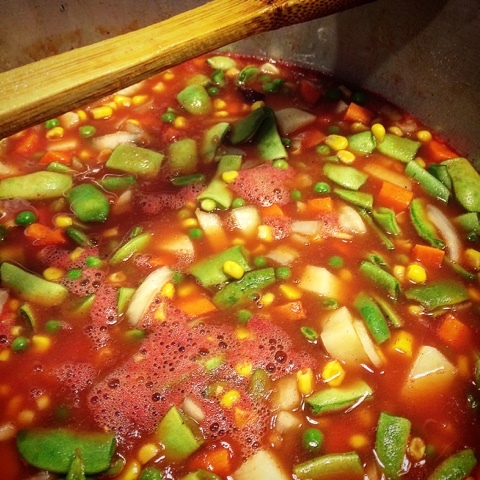 At Home with Chas: Canning Vegetable Soup... It's easier than you think! Canning Vegetable Soup... It's easier than you think! For as many years as I can remember, we have canned vegetable soup. It's one of those quick, go-to suppers and or lunches. You can pop open a jar and add hamburger meat to it to make it a bit heartier. Chicken. Pasta noodles... it gives way to a lot of variety. I'll give you the way we like it and you can take it from there. The method is the same on all vegetable soups, I would imagine... It's up to you on what you would like to incorporate. Those are the basics to what we like in our soup. I know there are many out there who use other types of beans, or veggies. Go for it. Make this to suit your family and your preferences. We canned 43 quarts yesterday with approximately this much veggies. This is where you get to play... If you like more potatoes, add them... More carrots? Go for it. Make soup. Make what you like. Get your pot of soup nice and HOT! You want to cook it anywhere from 5-15 minutes once it gets hot. Ladle into your jars leaving one inch of head space and use the same process for canning like you would always do. Hot lids and rings applied after filling your jars. We process our quarts in a pressure canner (DO NOT USE HOT WATER BATH CANNER FOR THIS!!! ONLY PRESSURE CANNER!) for 85 minutes at 10 lb pressure. If you want to make pints, it is 55 minutes for those. Continue to follow your canners directions... allow to cool and for the pressure to drop completely before removing your jars. When our canners are cooled down enough to empty, we have a large, thick towel laid out and set our hot jars on there to finish cooling. You will likely see your jars bubbling still. They are extremely hot, please use caution. Let your jars rest for a good 24 hours to make sure the seal has been made and your food is nice and safe. There you go... the way we make soup. Take what you can from our ways and go forth and put up some great garden fresh goodness for your family while you can! wouldn't cooking potatoes for 85 min. make them mushy? Not in our experience. They are still plenty firm. We usually use a russet or something similar in our canned soups. 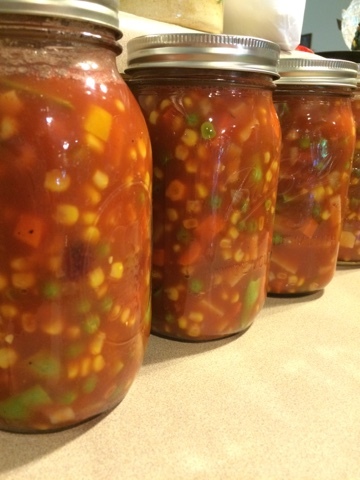 I have looked in many places for how much time to allow for pressure canning vegetable soup. All say about the same amount of time. I want to make sure I am careful about preserving things properly. I hope that helps a bit. Thanks for your visit! Lemons. Blueberries. Zucchini... Oh My!